Pigeonhole Live is an interactive Q&A platform for event planners and speakers of public conferences and internal corporate events. The solution gives audiences a voice by enabling real-time question and answer sessions, surveys, and live polls, bringing engagement and interactivity to presentations. Users can gather insightful data about audiences and drive useful, open conversations at meetings, events, or town halls. Audience members can post live questions to speakers to help them identify popular questions and topics to discuss. Users can curate the content posted with complete control over all submissions, including question filtering. All selected questions will be automatically reflected on the projector panel (question wall), and can be voted or commented on by other audience members. Pigeonhole Live enables speakers to ask multiple choice questions through audience polling and surveys. Members can participate in polls and surveys with a tap of a button on their smartphone using the mobile web app to provide real-time feedback. Results can be projected live on screen as votes are cast, including optional open-ended questions that allow audience members to enter free text responses. Members can sign in to their profiles or social media networks to share their identity, or participate anonymously. The progress indicator helps participants track questionnaire completion. The agenda displays all interactive sessions for the day, and allows attendees to navigate and access various Q&A, polls, and surveys available to them, useful for multi-track conferences. The Pigeonhole dashboard provides users with detailed reports and real-time insights of user statistics or employee engagement for poll, survey and Q&A at their presentations. Custom branding features allow organizations to match the Pigeonhole platform to their corporate branding guidelines to improve brand perception among audiences. The Q&A tool is certainly at the top end of available solutions. There are very competitive services available that have a more comprehensive, customizable and fresh look in terms of rendering input from the audience. For example pre-defined scales, 2x2 matrix, user supplied backgrounds. I would love to see more efficiency-oriented features on the admin side. For example the ability to duplicate complete events and not only individual agenda items, automatic recalculation of all starting times if you change the duration or start of an agenda item, pre-defined scales. The pigeonhole team is usually very responsive to feature requests and does a great job of keeping me updated on their feature roadmap. Helped to support a number of global eventsReally like the word cloud feature and different view options- it is very user friendly and participants enjoy the interactive experience (particularly more introverted characters who are less able to speak out in a big meeting). We have used it to complement a number of global events in Singapore, UK, Netherlands, Nairobi, US and Switzerland. The interactive use varied in different locations- Asia and US was best. UK and Africa least used-In Nairobi we found people preferred to speak out and in the UK participants were less comfortable with the technology. The most interesting use of the word cloud was in the US where participants submitted a six word story- this was visually very effective as the word cloud enabled us to vote on the best stories and participants really loved this. Since that meeting we have received requests to use pigeonhole for other US events. I recommend it!Easy to make a discussion during a presentation or a meeting, live responses are great as well. Also we had to contact the support of the software few times and it was a fast and pleasant experience! Feel free to reach out anytime you have questions! or choose the Enterprise Plan annual subscription. Contact PigeonLab for detailed pricing information. Pigeonhole Live is built to handle the various demands and scale of any event, from single session events to more complex multi-track conferences. Empower audiences to speak up and be heard by allowing them to ask and vote for questions that interest them. The dashboard offers a real-time breakdown of user statistics for polls, Q&A, and surveys at events for measuring audience engagement levels. Visualize the changes in real time during debates to compare and contrast results as the audience change their mind about a vote. By logging into Pigeonhole Live, attendees can browse through all the interactive sessions of the day at a glance via the agenda. Below are some frequently asked questions for Pigeonhole Live. Q. What type of pricing plans does Pigeonhole Live offer? Q. 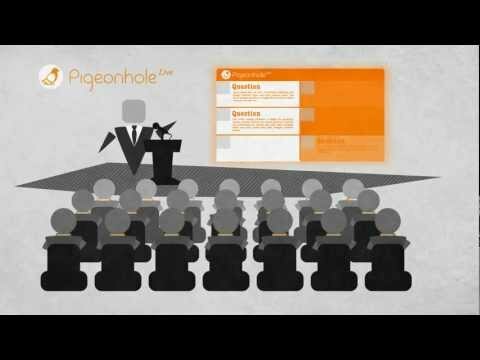 Who are the typical users of Pigeonhole Live? Q. What languages does Pigeonhole Live support? Q. Does Pigeonhole Live support mobile devices? Q. Does Pigeonhole Live offer an API? No, Pigeonhole Live does not have an API available. Q. What other apps does Pigeonhole Live integrate with? Q. What level of support does Pigeonhole Live offer? Q. Which apps is Pigeonhole Live compared to most often?